Fortunately, when you’re in good company and you have given yourself a little self-talk ahead of time to prepare yourself for being physically stressed out all day, you can handle almost anything. So, without further ado, Stimey’s (and Jess’ (and Algernon’s)) Trip to DC in Fun Little Bullet Points! 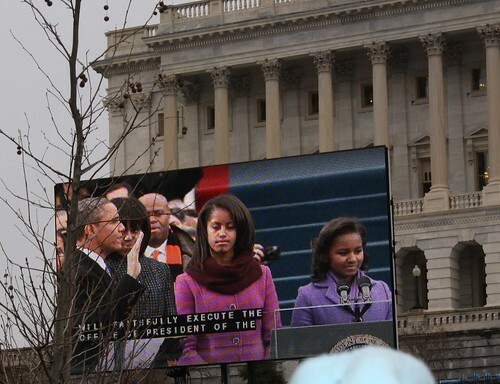 • The inauguration itself was a really amazing experience. 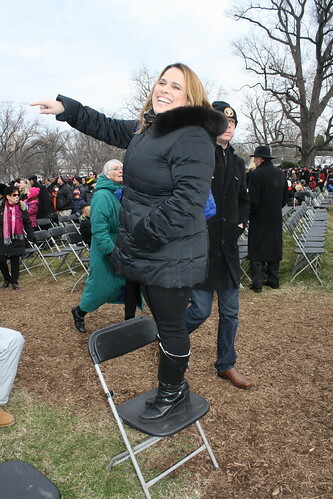 It was very meaningful to me to stand on the mall and watch a man I have great respect for be sworn in for a second term. His words about equality and rights felt important. They ARE important. I was proud of our government on Monday. That is not something that I feel very often. It felt good to feel that. It felt good to be in a crowd that felt that way too. I will hold the experience of standing in that crowd for a long time. I am so grateful to have been able to go. • Also, Beyonce is, like, STUPID BEAUTIFUL OMG. • Side note: who cares if she sang live or not? I mean, it’s kinda lame, but whatever. In terms of things I cared about at that event, that is very far down on the list. Decent weather, a clear line of sight, and everyone’s safety was waaaay higher up. Plus, it was cold and none of us wanted Ms. B to strain a vocal cord. C’mon now. • The message of human rights and equality that was sounded again and again at this event? The fact that so many speakers, including the man who gave the closing prayer, talked about gay rights? The fact that the disability rights movement is thiiiiiis close to being on the national agenda? That’s why I voted for Barack Obama twice. I hope that he—we—can make some progress over the next four years. • It’s good that the inauguration was so powerful and that Jess and Algernon were so fun to be with because oh jeez, the crowds and the hurry up and wait and the THIS IS MY WORST DAMN NIGHTMARE. • Actually though, the crowds were kind of phenomenal. If there were a crowd to be stuck in, this was the one. Considering how many people were in attendance and how difficult it was to get ANYWHERE after the event, this crowd was cheerful, funny, and supportive. There were a few bad apples, but for the most part people were a joyful, non-pushy, we’re-all-in-it-together-so-we-might-as-well-laugh-about-the-whole-thing kind of group. Considering that being shoved up against hundreds of other people with no escape is kind of the worst thing I can imagine, well, I appreciated that. • We continued to think this until we arrived at the mass of humanity standing between us and our entrance gate. BUT DON’T THEY KNOW WHO WE ARE?!?! I MEAN, WHO JESS IS?!?! • They didn’t know who we were. • But! 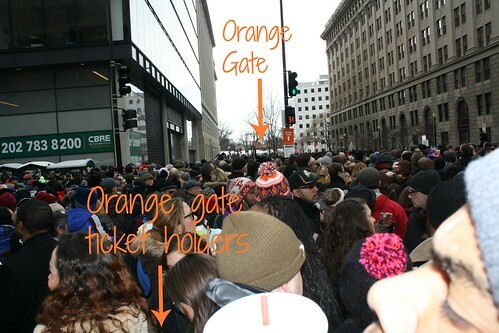 We were smart enough to listen to the rumors that started trickling down that said that orange ticket holders were being let in through the blue gate and, frankly, we weren’t getting anywhere where we were standing, so we headed down there. By the time we got there, they were letting lots of ticket colors in. Hooray for us, because the blue ticket section was in front of the orange ticket section. • Security was easy and I didn’t even get stopped, which is actually kind of a big deal because I ALWAYS get stopped. We followed the crowd onto the Mall right up until it stopped moving (Don’t let that wall stop you, crowd! Up and over! )—and here is where it sometimes comes in handy to be woefully unprepared and late because we ended up in a spot that was probably a lot better than we were supposed to have. You see the president up there, right? • Our timing couldn’t have been better. We arrived just as the ceremonies started. Bumbling ineptitude FTW! 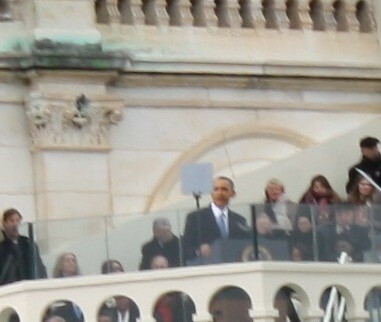 • We were close enough that we could actually see the president when he spoke. Well, we could have if the teleprompter screen weren’t directly in front of his face. I was pretty sure that I was going to have to draw his face on the screen for you all, but he leaned forward often enough that I was able to get a photo. I have, like, 25 photos of that man’s body with his face hidden by the screen. 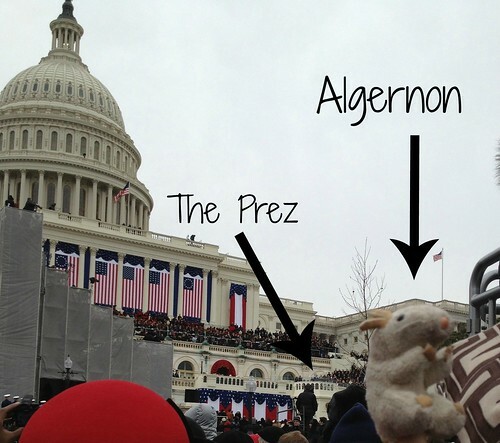 • Because Algernon is close personal friends with Mrs. Obama, I felt it was important to get a photograph of him with her husband. I got a couple of strange looks for taking this photo, but I am nothing if not committed to the joke. I posted this on Facebook and someone said we had nice teeth. It cracked me up. There ARE a lot of teeth in this photo, aren’t there? • Then, Jess and I discovered the real reason these events are nightmares. It’s not that everyone comes into town over the course of several hours in the morning. It is that those people then all want to leave town in the same hour in the afternoon. We managed to eventually maneuver our way our of our immediate standing area, but it took a while. 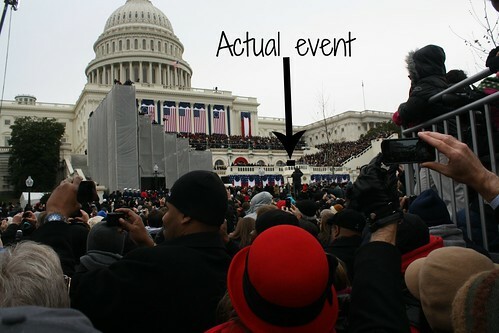 • Here’s something else about inauguration day. There is a parade. That parade will require the blockage of one of the streets adjacent to the Mall. When you reach that street and are all, “Why is this ridiculous street blocked off?” you will feel stupid when you realize that just because YOU don’t care about the parade, all the people lining the sidewalks do and you are a moron for not being aware of its existence. • Seeing as how I was the person who lives in the area, I tried to take the lead a little bit and somehow managed to lead us almost directly back to where we had been standing during the ceremony. I was ready to sit down and just never get back up again, but Jess hadn’t eaten anything yet that day, so she was motivated to get the hell off the Mall. I like that on the chair she is as tall as the guy behind her. • Also, oh-em-gee, isn’t she just the most adorable? Jess has a magnetic quality. 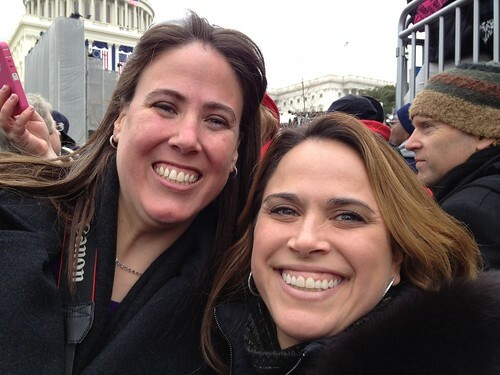 We were walking down the street on our way to the inauguration and a vendor looked at her, did a double take, and said, “You are gorgeous!” I think it has to do with the fabulous teeth. 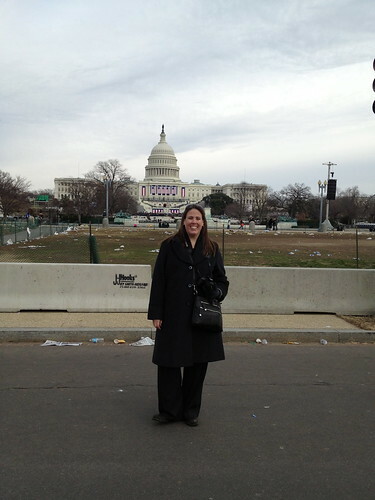 • I have never felt as not smart as I did trying to navigate that sea of people and inexplicable barriers that the Capitol police had erected and The People were attempting to trample down. We would find a hole and get through it (along with all the other masses) and begin shouting about FREEDOM OH THANK THE LORD SWEET FREEDOM, only to be confronted by another bottleneck of people. It was turrible. • It was also a little sad to see all of the trash that people left behind. Why, people? Why? We took this photo when we thought we had finally escaped. We were so stupid. • Then…in the distance…spotted by an eagle-eyed Jess…a Potbelly’s sandwich shop just off of the beaten path. 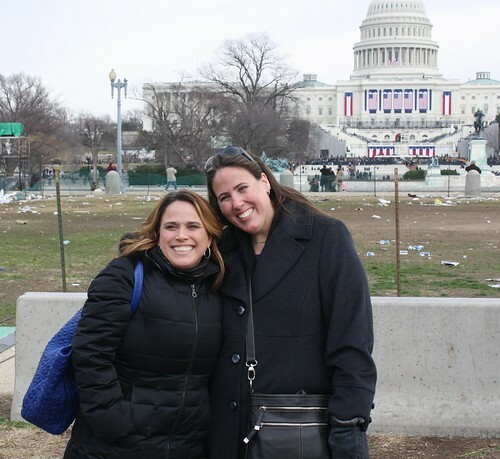 The place was packed, but not packed like the other places we’d seen—and once we realized that we were standing in the long line for the bathroom and were able to move to the substantially shorter line for food, we were very happy. 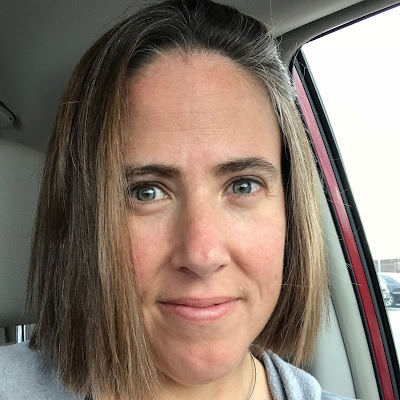 • By the time we went into the Metro station, Jess off to hang out with Ari Ne’eman and me to find my car where I’d abandoned it in Virginia, we were able to handle the sight of yet another mass of humanity trying to get down the escalators into the Metro station at L’Enfant Plaza. 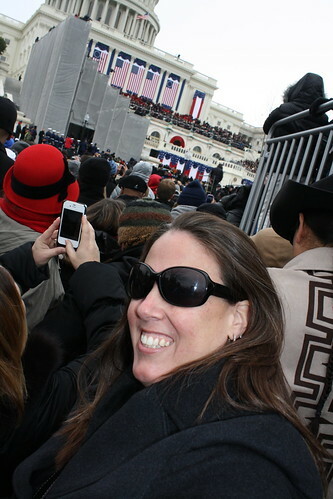 • I am so happy to have been able to attend an inauguration. It’s not something I ever imagined myself doing. 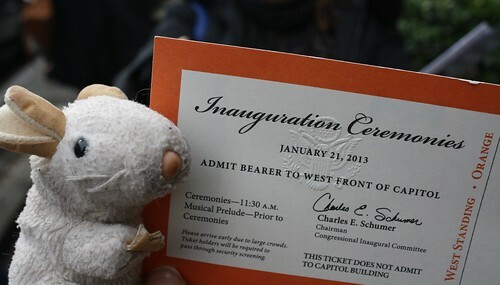 To attend the inauguration of this president on this day? So tremendous. Thank you, Jess. It was a wonderful experience. I hope you come back to DC someday and we will do something that will probably be less moving, but also less arduous. I also wrote more about Martin Luther King, Jr. and what he means to my family over at White Knuckle Parenting. Monday was a good day.